দীপপুঞ্জের অবস্থান (red rectangle and inset). The Okinawa trough in context of back-arc basins f the world. Donaldson, John and Alison Williams. "Understanding Maritime Jurisdictional Disputes: The East China Sea and Beyond," Journal of International Affairs, Vol. 59, No. 1. Dzurek, Daniel. 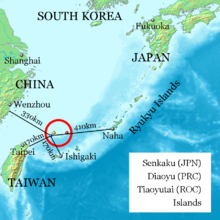 "The Senkaku/Diaoyu Islands Dispute," International Boundaries Research Unit (IBRU). October 18, 1996. Helflin, William B. 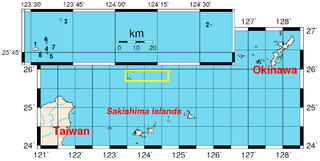 "Daiyou/Senkaku Islands Dispute: Japan and China, Oceans Apart," 1 Asian-Pacific Law & Policy Journal 1–22 (2000). Peterson, Alexander M. "Sino-Japanese Cooperation in the East China Sea: A Lasting Arrangement?" 42 Cornell International Law Journal 441–474 (2009). Ramos-Mrosovsky, Carlos. "International Law's Unhelpful Role in the Senkaku Islands,", 29 University of Pennsylvania Journal of International Law 903-946 (2008).